It was spring again. Birds chittered unhelpfully as they flapped from tree to tree, unsettling blossoms that fell like a gentle shower. The ground was buried pink beneath the soldiers’ treads. Those same soldiers were restless. Winter always did that to someone whose blood ran hot. Senedj was one whose blood ran hot often. In the dull winter, he and his fellow azure defenders had struggled to build some semblance of fortifications in this flowery shard of perfumed blossoms. Blue facial markings mixed with sweat and froze in a layer of crackling ice as he toiled against the blinding snow to construct a monument to Anubis. The enemy archers were almost in bowshot range, and the border fort they had constructed was all that would keep them alive in the coming seasons. Across the short no man’s land between Senedj and his fellow Egyptians, the Japanese were massing. 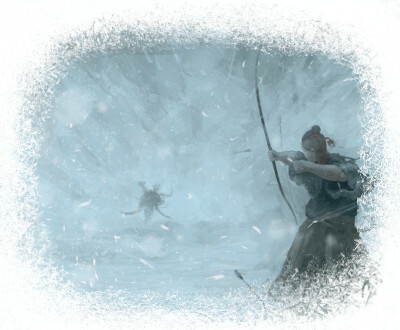 He could see their archers practicing, their samurai and priestesses in conference, their strange stone guardians prowling their camp’s borders. Sometimes Senedj thought those fox-like guardians were watching him. He shivered often that winter, but not just from the cold. Now that it was getting to spring, Senedj and his defenders had put the finishing touches on their fortress: two massive criosphinx sculptures. All through autumn the priests had prayed for guidance. They had found an ancient spell that would bring stone to life. All Anubis had to do was breathe life into them, give Senedj the extra edge he needed to win the field. Anubis would capture this land by summer. Senedj and his defenders waited. Nothing happened. They turned to the Sons of Horus in confusion, looked to the light of the Dog Star for prophecy. All that the priests said was that something was interfering with the magic. Spring was here now and the magic had passed. There would be no criosphinx joining their fight. If you prefer to learn a game through videos, you should check out our “how to play” videos below! 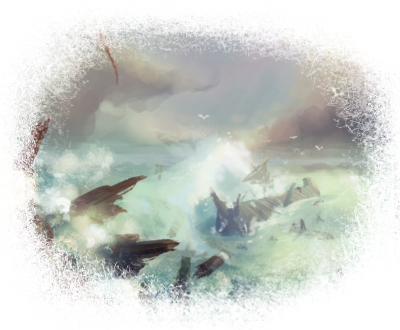 If you prefer to learn a game through pretty pictures and text, keep reading on as we go through a full turn of Tempest: Shards of the Gods. Winter (resource management phase): Determine leadership; draw your hand; and build, research and charge-up cards. Spring (combat phase): If two players have Troops in the same Shard, a battle is fought there. Take turns turning Troops to attack your opponent’s Troops. The combat winner is the player with the last Troops standing. Summer (movement phase): Advance your Troops towards your opponent’s first Shard, or retreat your Troops towards your first Shard. Autumn (deck-building phase): Gain any cards in your Research Row to your Deck; replace your Research Row; then prepare all cards in play. Tempest is played across a field of battle, constructed of Shards chosen before the game begins. At the start of the game, a player’s first Shard is their Temple; their second Shard is their Battleground, their third Shard is a combination of their Neutral Shard and their opponent’s. Each Deity card chosen, and each Temple and Battleground Shard, comes with 15 cards of varying types. These three lots of 15 cards are shuffled into a single 45 card Research pile. At the beginning of the game, these cards are drawn from the top of the Research pile to go face-up into the Research Row. Each player also has a starting pile of 10 cards: 5 Rites of Worship, 4 Mercenary, and 1 Border Fort. These 10 cards are shuffled together into a Deck. Both players have identical starting Decks. It is through game play that each player modifies their own Deck to suit their play style and react to their opponent’s. In Winter, the gods build their forces. Players first decide who is the Leader. At the beginning of the game, this is the player who has the highest cost card in the leftmost slot of their Research Row. This player will remain the Leader until they move Troops into their opponent’s Shards. At the beginning of every turn, both players draw back up to five cards. This means it is most useful to play your entire hand during your turn. If a player runs out of cards in their deck (an inevitability, with a 5 card draw and a 10 card deck) that player shuffles their Discard pile and places it face-down to form a new Deck. Players can then place aether on cards in their Research Row (researching cards), play cards from their hand into play (building cards), or place aether on cards already in play (charging cards). Cards can be slowly built over a number of turns by placing them face-down in front of a player and putting one or more aether on them. These cards may also be played as if they were in your hand, so it can be useful to play cards here (such as Events) to save them for later without clogging up your hand. What is aether and how do I get some? One feature of Tempest is that any card in the game may be discarded to produce aether. Every card has a number of dots in the top-left-hand corner. This is how much aether is gained from discarding the card. The more powerful and expensive the card, the more it will be worth to discard. So every turn, you must choose: do you play the powerful card, or use it to fuel your other ones? In Spring, the gods throw mortals into combat, fighting for dominion over the shards. In the beginning turns of Tempest, the Spring step is usually skipped. This is because it only takes place if both players have Troops in the same Shard. When this happens, players take turns using their Troops to attack those of their opponent. When all Troops have been turned, and are therefore unable to continue attacking, then players take turns retreating cards from the combat. If both players choose to leave Troops in the combat, all cards in it are prepared and the battle continues. Only when one player remains does Spring end. During Summer, players once again take turns advancing any Troops that did not participate in a combat. Troops may also be retreated if the battle looks to be going against them. Summer is also important because it is when players can win through Victory Points. If a player ever has 5 Victory Points or more, and they survive to Summer, then they win the game. The positioning of Summer compared to Spring is important for two reasons. First, a combat is always fought before Troops advance up the field. This means that when both players have Troops in the same Shard, they still have one more Winter phase to reinforce those Troops with Structures and Upgrades, or prepare nasty surprises with Events, before combat is fought. Second, this means that if a player has achieved 5 Victory Points, their opponent has one final chance to destroy them before the game ends. In Autumn, the gods prepare for the years to come. Remember way back in Winter, how players were able to put aether on cards in their Research Row? This is where it comes into play. 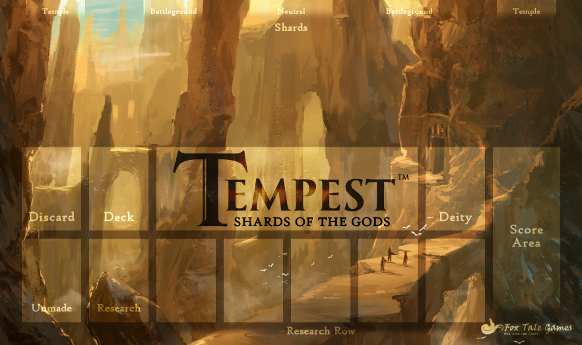 Tempest is, at heart, a deck-building game. This means that players build their decks up as they play the game, rather than before the game begins. It is during Autumn that this happens. Any cards that have been paid for are gained to a player’s Discard pile. (As mentioned before, these will make their ways to a player’s Deck when they run out of cards and need to turn their Discard pile into a new Deck.) Finally, any cards that do not have aether attached to them are placed in their owner’s Unmade pile. This serves two purposes: a player who does not want a card can quickly cycle through their Research pile throughout the game; and second, cards that a player wishes to keep for later are held in their Research Row until they can be paid for fully. You can check us out on Facebook, Instagram and Twitter for upcoming details! Or let us know in the comments below what you would like to see next. ← Ancient Egypt: Is Tempest “White-washed”?